Non-small cell lung carcinoma (NSCLC) accounts for 80% of lung cancer. Despite improvements in the therapy, the overall five-year survival rate remains less than 15%. The fact that microRNAs (miRNAs) are often deregulated in many diseases including cancer opens a new field of potentially powerful therapeutic approaches. miRNAs are negative regulators of gene expression. Currently, most effort has been made to elucidate the function of individual miRNAs. However, the ability of multiple miRNAs to potentate their impact by acting in a combinatorial mode, engenders a novel way of thinking. Using the example of miR-15a/16 and miR 34a, the present work investigates the combinatorial role of functionally related miRNAs in the tumourigenesis of NSCLC. In conclusion, the results of the present thesis indicate that miR-15a/16 and miR-34a are synergistically implicated in cell cycle control and likely contribute collectively to the tumourigenesis of NSCLC. 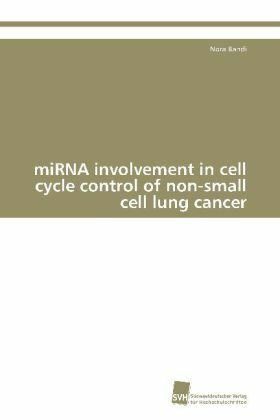 Since miR-34a and miR-15/16 are frequently down-regulated in the same tumour tissue, these findings may have important therapeutic implications for microRNA-based treatment of NSCLC.